Gravity Elude is a stranded spaceship in need of a captain to guide it and its crew away from a black hole. 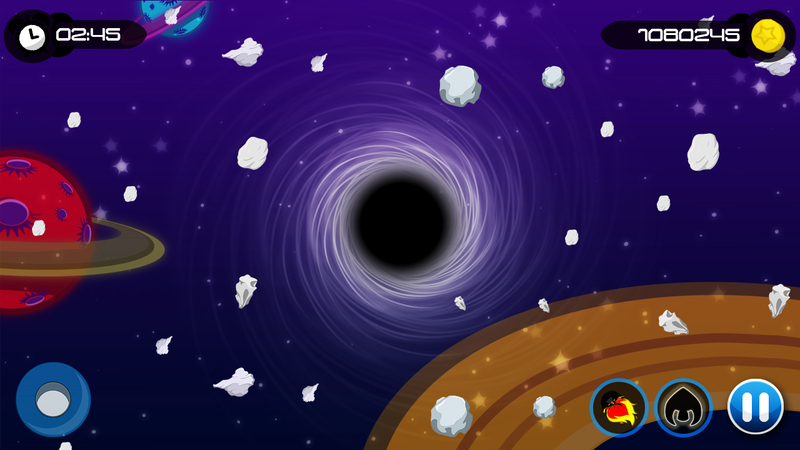 Object is to “Survive”, It invites players to experience the tension and excitement while escaping from the black hole. Evading all the asteroids that are trying to push him/her into the ball. The player is a stranded spaceship which is in the peril of getting sucked in by a gravity ball (Black Hole). Use the analog joystick to protect the player object at all times. To promote Gravity Elude and grow its popularity (top games), use the embed code provided on your homepage, blog, forums and elsewhere you desire. Or try our widget. TryFail is an attempt to examine life and the possiblity of transcending life's inevitable conclusion. Tiltz is a casual mobile arcade game where you try to guide as many falling objects as possible into a barrel using your fingers and device's tilt. Winter Maw is a first person runner in a glacial setting. Pilot a robot food cart in this arcade game. Serve customers and score big combos while flying around the city as fast as possible! WarForwards - It's an action game, inspired by the film "John Wick" and transferred to the 2D Top-Down Shooter format.